In this Feb. 6, 2014, file photo, Washington, D.C. Mayor Vincent Gray joins the Congressional Black Caucus on the national day of prayer to remember the poor and homeless, at the Capitol in Washington. 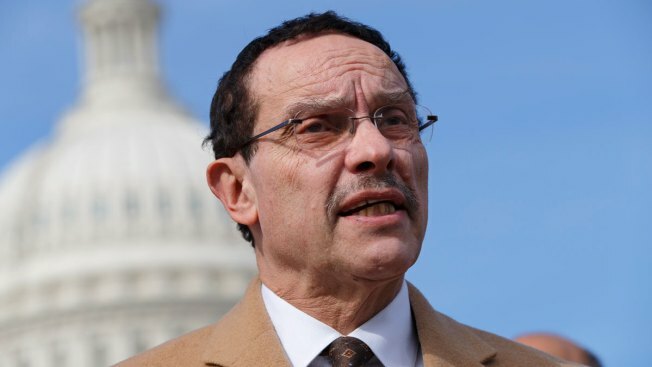 Whether incumbent Gray or one of his challengers wins the District of Columbia’s Democratic mayoral primary, the winner appears likely not to receive much support from voters. Gray is weakened by scandal and faces seven challengers, including four established local politicians. Former D.C. Mayor Vincent Gray is headed back to the Wilson Building, and voters want Congress to make the District of Columbia the 51st state in the union. Gray won 87 percent of votes in his race for the Ward 7 D.C. Council seat. Independent Gary Butler won 7 percent, and Independent Christian Carter won 6 percent. Gray lost the 2014 Democratic mayoral primary amid a federal corruption probe. Allegations of corruption within Gray's successful campaign to become mayor in 2010 began to surface just weeks after he took office. The U.S. attorney's office launched an investigation that ultimately led to six guilty pleas from people who helped Gray get elected. The probe revealed that an influential businessman poured $660,000 in illegal cash into the campaign, and prosecutors said in court that Gray knew about the illicit funding scheme. Gray denied all wrongdoing, and the investigation ended in late 2015 when prosecutors decided not to charge him. Eighty-six percent of voters approved the advisory referendum that asked voters "whether the [D.C. Council] should petition Congress to enact a statehood admission act to admit the State of New Columbia to the Union." Fourteen percent of voters rejected the measure. Mayor Muriel Bowser thanked D.C. residents for their approval of the "bold, new path" to statehood. "Today, nearly 80% of District voters cast a ballot for full democracy and citizenship. We pause tonight to celebrate this remarkable milestone in the District's decades-long fight for fundamental fairness," she said in a Facebook post. Del. Eleanor Holmes Norton hailed the results. "Today’s over-the-top majority signals D.C. recognizes that Congress needs a kick in the pants to jump start a new drive for statehood," she said in a statement. Though D.C. residents pay federal taxes and fight in the military, they have no senators and only one congresswoman without voting powers. “Despite the fact that we perform all the functions of a state, Washingtonians do not enjoy the rights of all Americans,” Mayor Muriel Bowser said in a speech to the Democratic National Committee in June. Del. Eleanor Holmes Norton will serve another term. Norton won 89 percent of votes. Norton has held the position since 1991. She faced Libertarian Martin Moulton and D.C. Statehood Green Party candidate Natale Stracuzzi. Voters have decided to keep Independent David Grosso and Democrat Robert White as at-large D.C. Council members. White won 53 percent of the vote. Grosso won 25 percent. Voters could select two candidates. Their competitors were G. Lee Aikin of the D.C. Statehood Green Party, Republican Carolina Celnik, Independent John C. Cheeks and Libertarian Matthew Klokel. Ward 2 Councilman Jack Evans and Ward 4 Councilman Brandon Todd on after running unopposed. In Ward 8, newcomer Trayon White also won after running unopposed.